Wood Floor Finishes: Which is Right for You? When choosing the right type of finish for your wood floors, consider your lifestyle and maintenance preferences. All wood floors will require routine maintenance, such as sweeping or dust mopping, to keep them looking beautiful and new, but different wood flooring finishes will have a big impact on how you care for your floor long-term, as well as how your floor will look in the years to come. Surface finishes are very popular because they are durable, water-resistant, and require minimal maintenance. Surface finishes are blends of synthetic resins. These finishes most often are referred to as urethanes or polyurethanes, and remain on the surface of the wood to form a protective coating. There are several types of surface finishes available: water-based, oil-based, acid-cured, and moisture-cured. Water-based finishes appear clear and will resist turning yellow over time. They have a mild odor when applied, and will dry in two to three hours. Water-based finishes are very durable. Oil-based finishes appear amber in color. They have a moderate odor when applied, and will dry in about eight hours. Oil-based finishes are very durable. Acid-cured finishes appear clear to slightly amber. 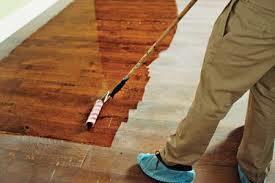 They have a strong odor when applied, and will dry in about two to three hours. Acid-cured finishes are extremely durable. Moisture-cured finishes appear clear to amber. They have a strong odor when applied, and will dry in about two to three hours in humid conditions. Moisture-cured finishes are extremely durable and are more moisture-resistant than other surface finishes. Wax finishes soak into the pores of the wood and harden to form a protective penetrating seal, which will appear low luster and amber in color. They have a mild odor when applied, and will dry in a variable amount of time depending on the type of wax used and the job-site conditions. Wax finishes are durable, but will show spots from water and other contaminates. Acrylic impregnated finishes are injected into the wood to create a super-hard, extremely durable floor. Acrylic impregnated finishes rarely are used in residential applications. They most often are used in very high traffic areas in commercial settings such as malls and restaurants. UV cured finishes are waterborne finishes that are cured by the use of ultraviolet light. The cure time is instantaneous. Multiple sheen levels are available to suit your taste. Penetrating and hardening oils are usually made of tun oils, linseed oils or other natural oils, along with blends of additional additives that can assist in drying and hardness. Talk to your project consultant at MODA Floors & Interiors about which type of finish best suits your needs and style. In this video, Shaw designers show you how to use the top colors of 2015 to refresh your home. These colors can coordinate with the neutrals you may already own. Don’t be afraid to add a splash of coral. 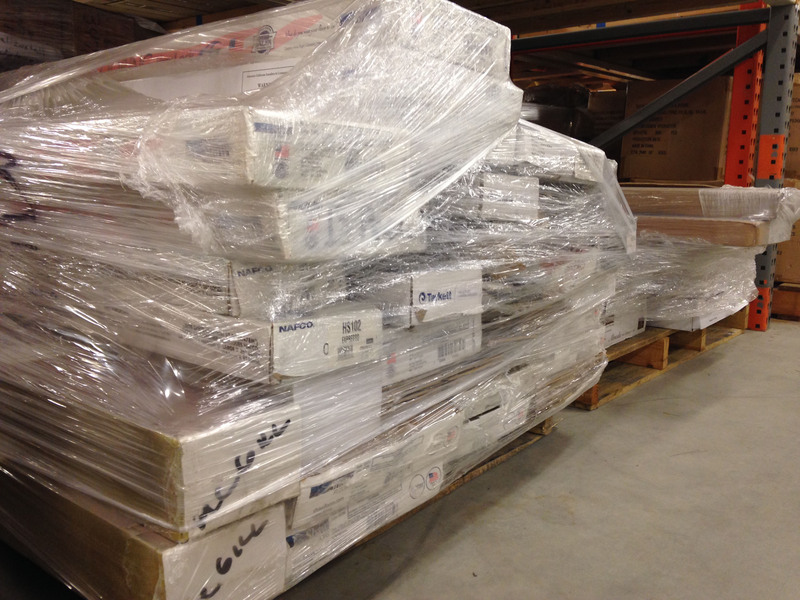 MODA Floors & Interiors recently donated 10 pallets of tile, hardwood and laminate to the Atlanta Habitat for Humanity ReStore, a nonprofit home improvement outlet store and donation center that sells new and gently used furniture, home accessories, building materials and appliances to the public at a discounted rate. Net proceeds from ReStore sales support Atlanta Habitat for Humanity’s mission of building quality, affordable, green homes in partnership with working families. Since December 2001, the ReStore has diverted more than 7,700 tons of materials from landfills by offering them to others for purchase and reuse. By donating to the ReStore, individuals, companies and organizations support affordable homeownership and community revitalization in Atlanta. Donations are tax-deductible as allowed by law. To make a donation, contact the ReStore at 404.525.2114 (Extension 155). They have a pick-up service for large items that you can’t easily transport. The Atlanta Habitat for Humanity ReStore is located at 271 Chester Ave. S.E. Additional information is also available at www.atlantahabitat.org/restore.